Fruit is good for us, and not just for our health. We could all do something to help to conserve orchards, keeping and creating them as places for fruit, people and wildlife. Many people are now looking to establish their own orchards, and area seeking traditional varieties of fruit to plant either on their own land, or in a community orchard. In the past, orchards were the focus of village life, where families and people of all ages would come together for village meetings, festivals and fairs. Orchards are once more becoming a local community focus, a way of bringing together busy people, young and old, newcomers and long-standing residents. The community orchard scheme helps to preserve old orchards and to create new ones for the benefit of wildlife and enjoyment of local people. Common Ground has a ‘Community Orchards Handbook’ contains all sorts of useful guidance for groups considering starting an orchard project, including sections on writing a constitution, dealing with health and safety, insurance and tackling leases. 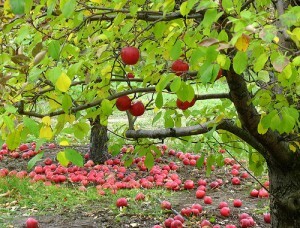 An orchard may be large and productive or just a collection of a few trees in a pasture or garden. Sensitive management can balance the aims of fruit growing, amenity, landscape and wildlife. Even if the orchard is not currently producing fruit, careful pruning and remedial treatment can produce a good crop.